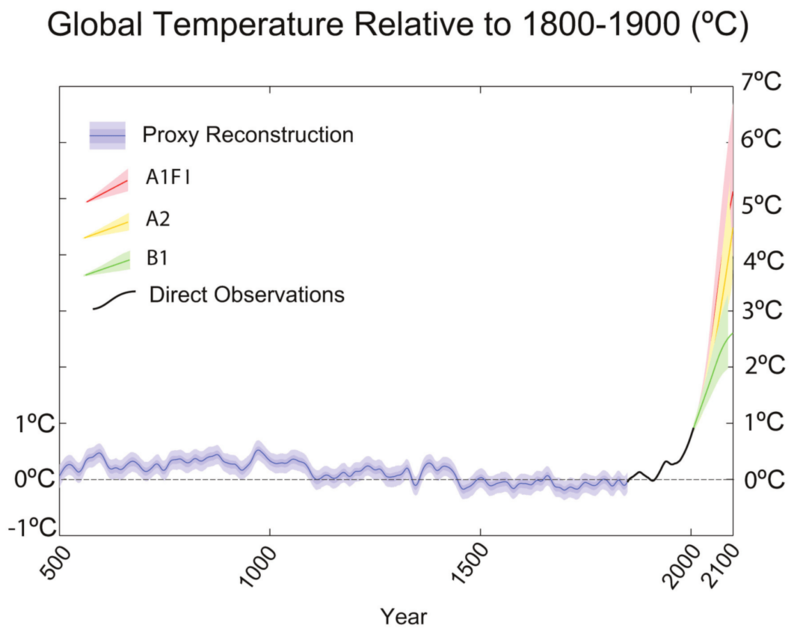 The first graph gives some projections longer than the 21st century – for selected scenarios, the temperature response is shown out to three centuries. The two graphs show different selections of scenarios: A1B, A2, and B1 in the first graph, and A1FI, A2 and B1 in the second. The baseline for temperature anomalies is different. The first graph uses the IPCC standard of the average global temperature from 1961-1990 as the zero point; the second graph uses the 18th century average as the zero point. As best I can tell, the difference is a little over 0.5°C, so the first graph shows a temperature anomaly for the end of the 20th Century as less than +0.5°C, while the second graph has this anomaly closer to +1°C. These choices are interesting for a number of reasons. Most obviously, the second graph is much scarier. The extra context from the pre-industrial era emphasizes how unusual the warming is, and the compressed timescale emphasizes the rapidity of the warming. The pre-industrial baseline shifts the Y axis slightly, so the warming from the shared scenarios, A2 and B1, looks a little worse. And by cutting the graph off at 2100, you don’t see the eventual stabilization for the B1 scenario. The selection of which scenarios to show is important too. The SRES scenarios are projections for future emissions of greenhouse gases, based on different assumptions about economic development, globalization, and how quickly we switch to cleaner energy sources. The A scenarios represent worlds in which economic growth is emphasized over environmental protection, while the B scenarios represent a future world in which environmental measures are prioritized over economic growth. These scenarios define the emissions profiles used as input to the models, which then calculate the temperature response (because the models can only compute the earth systems’ responses to emissions levels; they can’t predict what humans will actually do!). A1FI represents strong economic growth, a strong globalization trend, and aggressive exploitation of fossil fuels (the FI stands for “fossil fuel intensive”). That’s basically the world preferred by the oil industry and the US Republican party, i.e. “Drill, baby, drill”. In contrast, A1B represents similar economic trends, but more of a balance of energy sources – i.e. something closer to what Obama was advocating in his state-of-the union address. A2 is an intermediate scenario, with less globalization, and less technological development, and slower growth in the developing world. B1 is what we might get if the world gets its act together and agrees tough new targets to reduce global emissions, and then actually follows through and implements them – i.e. something dramatically different to the Kyoto experience. The data comes directly from the science (i.e. from the models for future projections, and from observations for the years prior to 2000). But the choices of how to present the information are not scientific choices, they are value choices. The choices made in the first graph all tend to play down the seriousness of climate change, while the choices in the second graph all tend to emphasize it. In particular, the choice not to include A1FI, the business-as-usual path in the first graph could be argued as a very serious omission – a failure to warn the world how bad it could get on our current path. 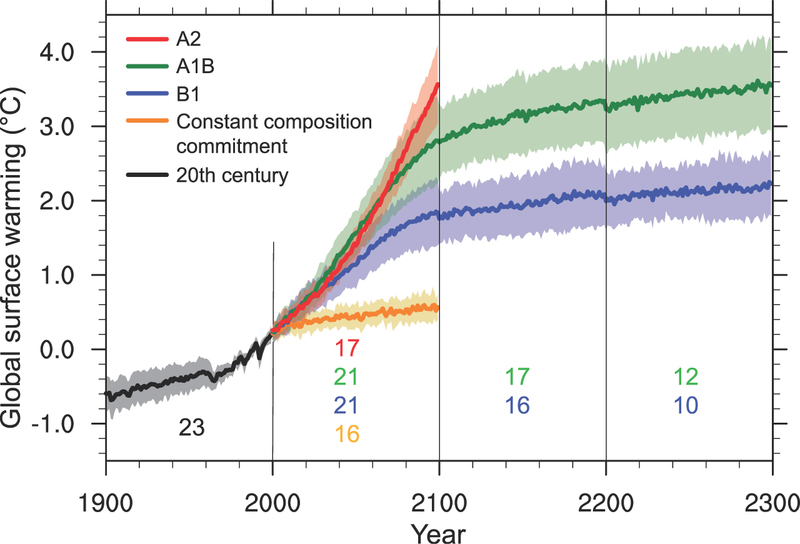 Similarly, the decision to extend only the lower scenarios into future centuries conveys an overall message that we get to choose between two paths, one that stabilizes around +2°C and one that stabilizes around the +3°C level. This is not a fair representation of today’s policy choices. Okay, now I should say where I got the two graphs from. The first might be very familiar – it’s from the IPCC 2007 assessment. The second is from the Copenhagen Diagnosis in 2009, a document put together by a respectable group of scientists (many of them are IPCC lead authors), intended as an update on the last IPCC report, taking on board developments in the science, and in particular, a growing body of evidence that the IPCC projections have tended to underestimate the trends. The question of which graph better represents the prognosis is clearly a value judgment. Having compared the two, I now feel that the IPCC graph is missing a major part of the story, and hence is misleading. I think there are weaknesses in the second graph too, as the compressed timescale for the 21st century makes it really hard to discern the three trends. But it certainly seems a lot more appropriate to include more of the pre-industrial context, and to choose a pre-industrial temperature baseline. These graphs have the potential to take on an iconic status, and to directly affect people’s thinking about climate change. We really ought to examine more closely the choices that were made in presenting them. Update, Feb 3 2011: Bart does a similar comparison with a third graph, which does a better job of the pre-industrial reconstruction, but still suffers from all the other problems of the IPCC graph. It’s more than a direct value judgement; there’s a need to anticipate other people’s value judgements as well. The second graph has the problem that the last century is so compressed that it’s difficult to see what’s happening so it would be tempting to expand the scale by just plotting from, say, 1500. However, that would lead to accusations of cherry picking as it ignores the MWP. Perhaps a sensible compromise would be to go back to 900 – a nice round 1000 years with 100 years bolted on each end. That’s funny that you bring this up; I’ve thought about those (well, similar) graphs as well, but then the one here (http://www.skepticalscience.com/Climate-Change-Past-Present-and-Future.html ) and the second one you showed. They both show a similar timeframe, which is what I wanted to show in a climate presentation: Future projections in the context of the past. The first one has the problem that the constant composition projection is entirely meangingless: It’s an unphysical scenario and not more than a thought experiment (and not a very useful one at that). The second one has the problem that the error bars around the past temperatures (back to 500 AD) seem to be a bit narrow, and I like the spagetti graph of the past (as shown in the Chapman and Davis paper, reproduced at SkS) better. The problem with the first I found more serious, so I show the second one in my presentations.